Product #20517 | SKU 19125C | 0.0 (no ratings yet) Thanks for your rating! 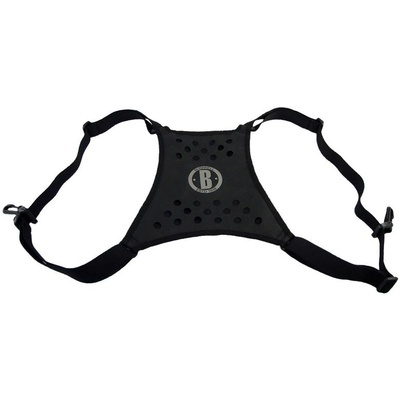 The Bushnell Deluxe Binocular Harness Strap is designed to allow you to use your shoulders and torso instead of just your neck to support the weight of binoculars, rangefinders, or light cameras. The straps are made of an elastic material which allows you to keep your device comfortably upon your chest even when engaging in an active, bouncing activity such as riding a horse. When perfectly positioned, you'll have your optics just below your chin so that you barely have to move them to be sighting quickly. This deluxe version has a wide, perforated panel for your back, to best support heavy binoculars with big, heavy objective lenses.